Nathen Mergen is a second-year student at Florida State University whose world travels have given him a global perspective that inspires his devotion to local needs. Mergen was born in St. Cloud, Minnesota, but grew up in many cities thanks to his father’s far-reaching assignments as a U.S. Marine. Mergen attended two high schools — one in North Carolina and another in Japan — and experiencing the Japanese culture gave him a unique perspective when he returned to the United States. Mergen arrived at Florida State intending to major in psychology, but an unexpectedly insightful meeting with Thomas Blomberg, dean of FSU’s College of Criminology and Criminal Justice, convinced him to change course. Mergen switched his major to criminology and immediately dove into related research. The research project galvanized Mergen’s decision to focus on criminology and cybersecurity. He continued to investigate cybercrimes, specifically against businesses, along with a doctoral student and other undergraduate students. The experiences gave Mergen the knowledge and confidence to pursue his own ideas for research with the help of a Florida State IDEA grant. IDEA grants are available to all undergraduate students so they can pursue original research, creative endeavors and develop existing ideas. Grant recipients present their findings at FSU’s annual President’s Showcase for Undergraduate Research Excellence. Mergen used his IDEA grant funding to travel to North Carolina and Washington, D.C., to survey businesses and industry professionals about their cybersecurity problems. That research gave him a firsthand look at the issue of cybercrime. Cybercrimes against businesses include computer system attacks, viruses, phishing scams and more. These crimes can be detrimental to the reputation, intellectual property and privacy of businesses. As an FSU student and resident of Tallahassee, Mergen has excelled in class and worked to elevate the community. 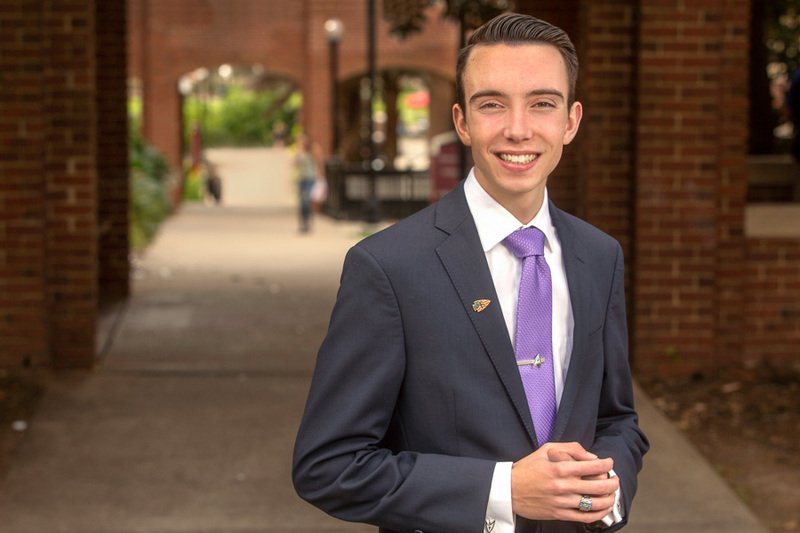 He joined Florida State’s Service Scholar Program, a four-year program recognizing students with outstanding records of service and leadership. Scholars participate in 75 hours of community service each semester, and they connect with a supportive second family of service-focused student leaders. Mergen has volunteered with two local programs that he’s passionate about. He serves at the Leon County Sheriff’s Office and Correction Center and helps administrators with prisoner rehabilitation programs. Mergen’s other service project focuses on “viewpoint diversity,” on campus and off. “Viewpoint diversity is a term that encourages college communities to create an environment where students can respectfully disagree with each other,” he said. Mergen works with Village Square, a local nonpartisan institute, to encourage students to discuss important issues in politics, society, the environment and beyond. “The goal is to moderate these kinds of discussions between individuals and allow them to find common ground and shared purpose,” he said. Mergen’s extensive service and research experiences at Florida State have revealed valuable lessons and many opportunities for the future. He’s interested in a career in foreign diplomacy or intelligence, and he’s taking steps toward that goal on three fronts. Mergen plans to graduate with a major in criminology, a minor in Middle Eastern Studies and a certificate in U.S. intelligence. As a high-achieving sophomore, Mergen still has much to accomplish at FSU. But he can already see and appreciate FSU’s profound impact on his future.